ABOVE: The Hotel Santa Chiara is directly on the Piazzale Roma. 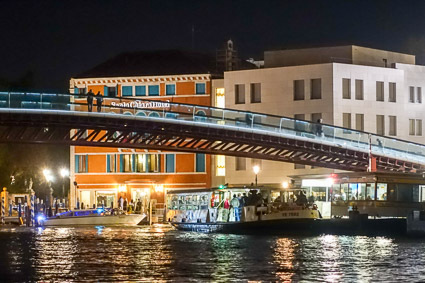 The Calatrava Bridge or Ponte della Costituzione (foreground) connects the square with Venice's Santa Lucia Railroad Station. The Piazzale Roma is Venice's gateway for buses, land taxis, trams, and other wheeled traffic from the mainland. It's also home to the People Mover, an elevated tramway that runs to the Marittima cruise basin and the Tronchetto parking island. For more listings, see our Hotels near the railroad station page. The hotels on that page are also easy to reach from the Piazzale Roma, although you may have to cross the Ponte di Calatrava (a modern bridge that is high but with a gentle incline that makes it fairly easy to cross with bags).